Asian markets fell Tuesday as the charging of Chinese giant Huawei in the US cast a shadow over upcoming trade talks, while investors were also tracking a Wall Street sell-off fuelled by concerns corporate profits. A busy week across the globe got off to a nervous start Monday after industrial giant Caterpillar and chip company Nvidia projected worse-than-expected results for 2019, citing ongoing weakness in China. The announcements from two of Wall Street's big-hitters follow similar warnings from Apple and Samsung and sent shudders through trading floors. "Caterpillar and Nvidia are not the first companies to blame China for their afflictions, but both companies are seen as industry bellwethers and their disappointing results provide further evidence that this time China's slowdown is for real," said Rodrigo Catril, senior markets strategist at Australia National Bank. The warnings come as Beijing struggles to kickstart the world's number two economy, which expanded last year at its slowest pace for almost three decades, with a mammoth debt mountain and the US trade war hampering efforts. 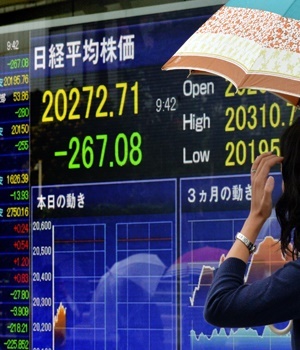 In early trade, Hong Kong was down 0.6% and Shanghai shed more than 1% while Tokyo dropped 1% by the break. Sydney dropped 0.6% and Singapore was 0.4% lower with Seoul dropping 0.5%. Wellington and Taipei were also well down but manila and Jakarta rose. The main focus of attention this week is on the two-day meeting between China and US officials aimed at resolving the long-running trade war that has been a drag on equities. Donald Trump will meet China's top economy envoy Liu He during the talks, which start Wednesday, while US Treasury Secretary Steven Mnuchin said he expected "significant progress at these meetings". However, the negotiations will begin under a cloud after the US Justice Department announced criminal charges against Chinese telecom titan Huawei and two affiliates on a number of technology theft counts as well as fraud related to Iran sanctions violations. The firm's chief financial officer Meng Wanzhou, who has been held in Canada for weeks, was also charged and faces extradition to the US. "Both sets of charges expose Huawei's brazen and persistent actions to exploit American companies and financial institutions, and to threaten the free and fair global marketplace," said FBI Director Christopher Wray. While the US has played down the significance of the Huawei row with regard to the talks, it ratcheted up the pressure ahead of the meeting, and comes just over a month before the end of a 90-day deadline set between Trump and Xi Jinping on reaching a trade deal. On oil markets, both main contracts were slightly higher after tanking on Monday as worries about the slowing global economy trumped political instability in major producer Venezuela, which analysts said had already been priced in. "Expectations for future demand is becoming a worry," said Sungchil Will Yun, a commodities analyst at HI Investment & Futures Corp. The pound was slightly lower against the dollar but continued to hold its ground ahead of a vote in parliament later Tuesday on Prime Minister Theresa May's revised Brexit deal. But before they vote on the deal, they must decide whether or not to include a series of amendments, one of which would open the door for MPs to bring in legislation preventing Britain leaving the European Union without a deal on March 29. It would force May to delay Brexit for nine months if her plan is not approved before February 26, and give lawmakers the ability to indefinitely extend the deadline. The sterling has enjoyed healthy buying in recent weeks on expectations that a no-deal exit will be avoided.